London (AFP) - Big-hitting Jelena Ostapenko believes she could comfortably play five-set matches at the Grand Slams -- as long as they didn't stretch to epic proportions. 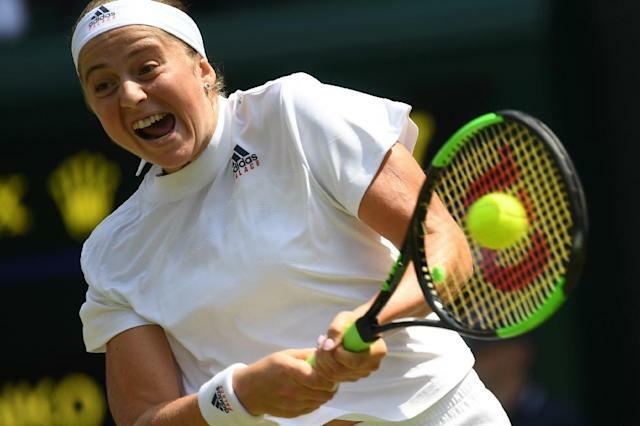 Ostapenko was beaten in the Wimbledon semi-finals by Angelique Kerber 6-3, 6-3 on Thursday in a tie which was over in just 68 minutes. Seven-time champion Serena Williams then needed only 70 minutes to get past Julia Goerges 6-2, 6-4 in a truncated Centre Court programme. On Wednesday, Rafael Nadal needed four hours and 48 minutes to see off Juan Martin del Potro in a five-set quarter-final. Roger Federer was defeated by Kevin Anderson, also in five sets, in four hours and 14 minutes. "That's a good question, but I think men are much stronger than we are. They are so used to playing five sets in Grand Slams," said 21-year-old Ostapenko, the 2017 French Open champion. "I think for us it would be something strange because we're not used to doing that. "It depends how long the match would be. If it's five hours, I think it would be tough. But if the match was three and a half or four hours, I think that could work. "I practice sometimes three hours in a row, so I'm kind of used to it."